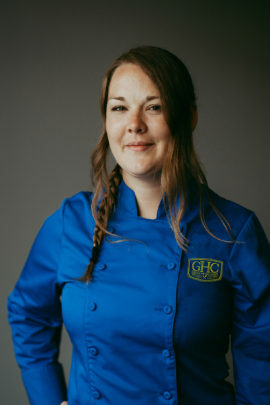 Meet Blue Coat Chef Amanda. She’s been a valued member of the Blue Coat Army since 2014. Amanda was inspired to become a chef because of the never–ending world of food and flavor possibilities, and she lives true to that inspiration every day in her fraternity’s kitchen. Don’t be surprised when you walk into Amanda’s kitchen and you think that you’ve actually walked into a sushi restaurant. Her favorite food to cook is sushi and she is great at it! She’s always working to one-up her last sushi display. Amanda always makes sure she has the best food on campus paired with the best music to go along with it for the full experience.